Meet Jenny Harris of Catkin Design. Jenny has recently started a new garden design and consulting business here in Friday Harbor. “Catkin is a new iteration of my horticultural life” she says. Originally called appropriate horticulture, what Jenny does is now called Ecological Design – a self sustaining kind of garden design that is supportive of all the natural processes and biological organisms involved, such as insects, birds, mammals and pollinators as well as the plants themselves. Jenny studied and worked in horticulture in California before moving to Lopez Island in 1993 and now has made Friday Harbor her home as of 2014. 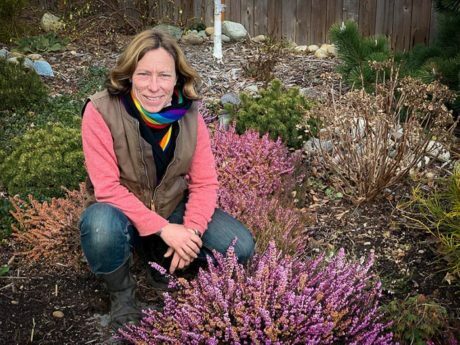 She recently traveled to Europe, and attended an Ecological Design horticultural symposium in Essex, UK that stressed the New Perennial Movement. She wants to bring those ideas back here to San Juan Island. So how is Catkin different? “I’m not a big gardening firm, and I’m not a maintenance crew. I prefer to teach gardening techniques and I love to work with people who love to garden, and help them create their vision.” However, she has a mutually beneficial collaboration going on with Desiree Nabong and Adam Chorba-Pulkka of Frogsong Yard & Garden for clients of hers who need help getting the actual gardening work done. To that end, there will soon be a weekly or monthly email newsletter for members to see what’s seasonably available. It’s free to join and there are no obligations – just send Jenny a request at quercus@rockisland.com to find out more. And be sure to check out her website at www.wildcatkin.com as well.